Travelling along the coast south from Batemans Bay, you reach the coastal villages of Rosedale, Tomakin, Mossy Point and Broulee all of which are very popular with holiday makers for their beautiful beaches and central location from which to discover the attractions of this special part of the coast. Tomakin village lies on the coast beside the mouth of the Tomaga River. Magnificent unspoiled beaches are a feature of this region which is very popular with holiday makers looking for a traditional Aussie beach holiday. Only 10 minutes from Mogo and about 20 minutes from Moruya, Tomakin is also centrally situated to discover the forests and waterways that give the Nature Coast its distinctive qualities. There is a licensed club in the village, quality cabin and van accommodation while the "bright lights" of Batemans Bay are only a short drive to the north. Don't miss the famous Mogo Zoo, where endangered animals are cared for in an attractive rural setting near the craft and antique village of Mogo - only 10 minutes away. On a headland between the Tomaga River and Candlagan Creek, the village of Mossy Point is a secluded spot comprising mostly residential houses some of which are available for holiday rentals through the local real estate agents. To the south, Mossy Point abutts the pretty Candlagen Creek which offers quiet swimming places and thence to the magnificent Broulee Beach and Broulee Island. Broulee is one of the most popular holiday centres on this part of the coast. 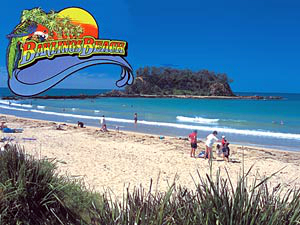 Broulee Beach (shown above) is very popular for its great surf and wide expanse of golden sand. To the south the beach forms an isthmus to the Broulee Island nature reserve which features the "Pink Rocks". There are a number of accommodation alternatives including holiday houses, furnished apartments and units as well as caravan parks nearby. Broulee is only a short distance to Moruya airport and Moruya itself, while Batemans Bay is only a 20 min drive to the north. Discover the broader region and a variety of accommodation alternatives by way of our clickable Batemans Bay region map.